On October 8, 2012, Canada lamented the passing of Walter Carsen, the noted cultural philanthropist who had also turned 100 earlier that year. His generosity has extended to the National Ballet of Canada and several public galleries, including the AGW. This exhibition focuses on his interest in printmaking, predominantly by showcasing Paris and New York artists after WWII. The collection reflects two themes: wartime resistance by the creative community, and the reconstruction of Paris as a centre of continuing significance. Carsen fled Germany, via Britain, ending up in Toronto during the war where, as a Jew in refuge, he remained grateful to Canada and became an important philanthropist. In the context of the Gallery's predominantly Canadian art collection, Carsen's gifts -- which include works by Clavé, Dubuffet, Zadkine, Albers and those associated with the Netherlands' Cobra Group -- brought an important international perspective to a border-city collection and significantly enhanced our print holdings. 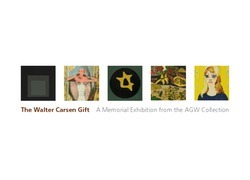 Although Carsen's collecting patterns excluded work by female artists, his donations positioned the AGW to begin building relations with contemporary collectors at a time when the Gallery was strengthening its commitment to promoting living artists.